The wooden bed model Beatrice, in style neo classic deluxe, restyled by Orsitalia, is a double bed with luxurious and fluid lines, and it is entirely produced in Italy by skilled craftsmen of Orsi Italia. The headboard and the footboard of the high luxury classic baroque model Beatrice can be custom-made using different kind of polish or with leaf finishing as gold, silver or copper. 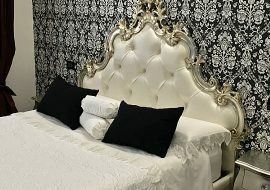 Beds produced by Orsiitalia are upholstered by hand with tufted headboard, they can become modern using ecological leather or modern textiles; classic deluxe using velvets combined with Swarovski buttons or special trimmings. Orsitalia can supply all beds of its classic or contemporary collection in different sizes, with upholstered bed frame or bed box even removable and washable. 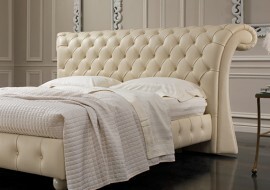 Combined to Beatrice double bed we produce the Beatrice armchair to let yr bedroom become elegant. Beatrice double bed and armchair are suitable for any kind of ambience both modern, design or high classic one; in hotels for contact use; in fashion shops. Double Bed with headboard and footboard in strong selected turned and shaped wood.